Arthur James Pearce was a cobbler and his father-in-law William Henry Luff was a cabinetmaker. Here are their stories below and in the next blog. Arthur James Pearce was born to parents William Pearce and Jane Fogden and was baptized on 30-07-1865 with sponsors Charles Goodwin Brisley and William Pearce. Arthur James Pearce married Eliza Jane Luff at the house of Mrs. W.H. 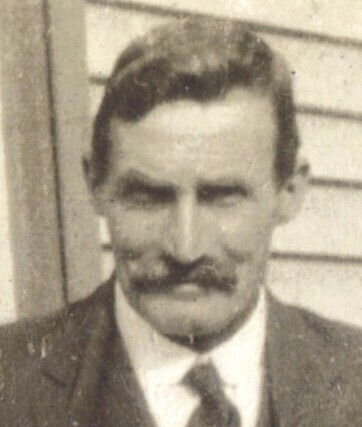 Luff who lived in Livingstone Street, Linwood, Christchurch, on 20-06-1893. They had six children. I have further details on this children and am willing to share if you can prove you are related! The family was living at Livingstone Street when William was born in 1895, possibly with Mrs Luff. Later on the Pearce family bought a house at 60 Aikmans Road, Christchurch. The house had sparse furniture with the absolute basics. It had hardly any ornaments. The kitchen had a kitchen table and chairs and a coal range. The pantry was next to the kitchen. The family mainly ate in the dining room, which had a big oval table with a red velvet tablecloth. There was always a bowl of flowers in the room. An old chesterfield suite, a piano and an open fireplace were in the lounge. Arthur James Pearce was a cobbler. He did his work at home in a shed out the back of the house at Aikmans Road. He was a tiny man of about five-foot tall. Arthur was on the fire brigade. He loved rabbit shooting and went with his sons in their collars and ties. He loved having a gun dog. These were mostly spaniels and were almost always called Laddy. They also had a pet ferret, which was sent down rabbit burrows. Arthur was quite a serious man. Apparently he was very strict and there were hardly any laughs in the house - but this was common in the past! When Arthur died in 1943 of a strangulated hernia, he left all his belongings to his wife Eliza; the total being nine hundred and forty two pounds, eight shillings and four pence. Arthur and Eliza are buried in Bromley Cemetery. Eliza Jane Luff was born in Grahamstown, Thames in 1871 to William Henry Luff of London and Elizabeth Gillespie from Glasgow, Scotland. She married Arthur James Pearce and had six children. When Eliza married Arthur, her occupation was a dressmaker. Apparently she worked for Ballantynes at one stage and they never paid her! Later on, her daily life was spent mainly looking after the family but she loved to do some gardening. Arthur did most of the flower garden, however. She was a very kind lady and one of her granddaughters used to call her 'Black Grandma' as she always wore black. She was a favourite Grandma of my own grandmother and Eliza was a very happy person. She was very tall at five foot eight when compared with Arthur who was only five-foot tall. Ethel and Alby were still living with Eliza when she died in 1949. She died of heart failure in her sleep. 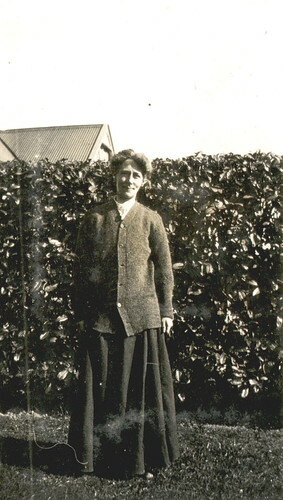 Eliza Jane Pearce at 60 Aikman's Road, Christchurch, 1920s. The next blog is on William Henry Luff, a cabinet maker, and his wife.